FACT CHECK: Did DoubleTree Hotels Display a Sign Denying Service to Military Members? "Two Supervisor-level employees, who have since been terminated, made poor decisions including displaying a sign that they created." DoubleTree Hotels displayed a sign reading "no longer serving military personnel and their guest(s)." 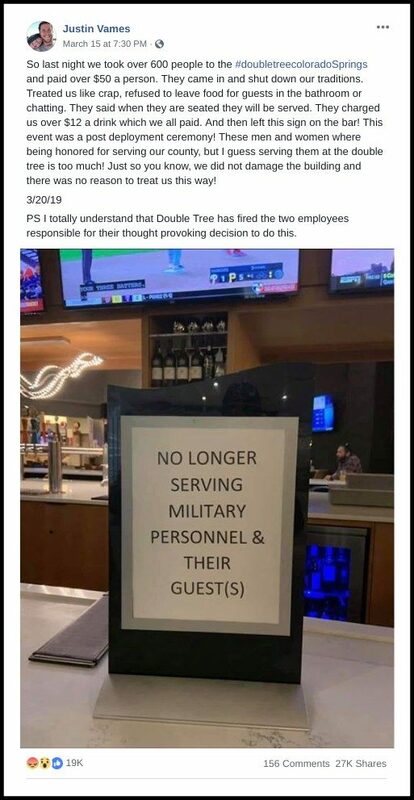 A sign reading "no longer serving military personnel & their guest(s)" was briefly displayed at one DoubleTree Hotel in Colorado Springs. This sign was displayed at a single DoubleTree Hotel only, did not reflect an official policy of the DoubleTree chain, and has since been removed. This photograph is genuine, and the accompanying narrative appears to be accurate. 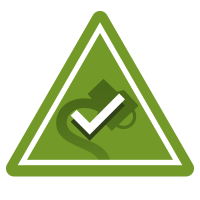 However, a number of social media users encountered this image in social media posts containing incomplete or inaccurate information. For example, some users shared this image as if it were taken at a hotel in Texas, not Colorado. 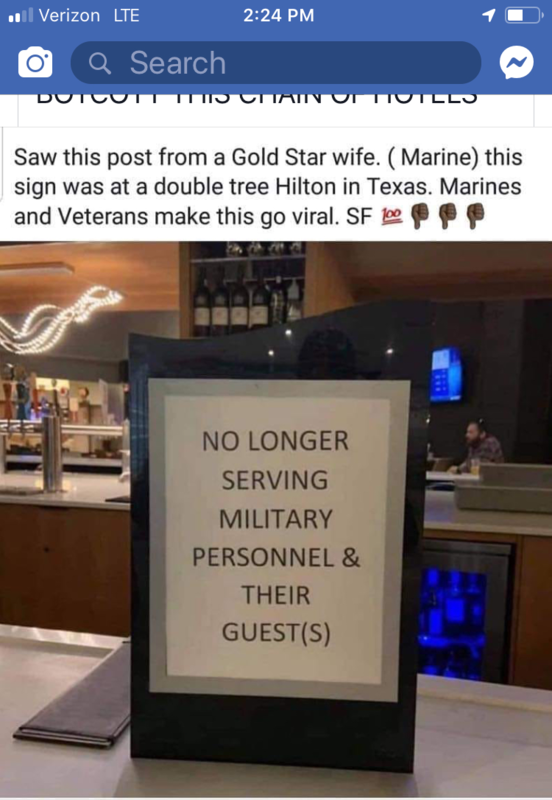 After this image went viral, we also received a number of queries from readers who seemed unsure if the military had been banned from all DoubleTree properties (as well as those of their parent company, Hilton Hotels). This sign was reportedly put on display by two of the hotel’s employees after an event involving military members. The sign was later removed and the two employees were fired by the hotel. Osbourne, a disabled veteran whose husband is currently serving, says the group was in the process of an army grog. That’s a ceremony in which a unit honors those who have served, POWs/MIAs status, and those lost. Based on unit tradition some odds and ends are added to the alcoholic and non-alcoholic mixes. The chain of command can also call for someone to drink from the grog if they violate etiquette. According to Osbourne, there was no bad behavior on the part of the roughly 600 people in attendance. She says the hotel staff started blocking access to the grog, an incident that the attendees tried to handle in a professional manner, but soon the bars were closed and the signs posted at 9 p.m. I wanted to take this opportunity to provide again my sincerest apologies for the situation that took place last week during a Military Ball held at our property. I take this matter very seriously and personally as I have a brother who is a Navy Veteran. Two Supervisor-level employees, who have since been terminated, made poor decisions including displaying a sign that they created, which we find very offensive. Their actions were in no way associated with the values of the hotel management. Their actions do not reflect our principles or beliefs, and this is not how we train our employees. We deeply regret any offense to the service members and their guests, and have implemented a retraining of our employees to ensure this does not happen again. We are honored and proud to support our Military community and their families, and look forward to continuing to serve those who serve us. Again, we are very sorry for the situation that occurred at our property and welcome all Military service members, their families and community to our hotel. Osbourne told KOAA that she had accepted the hotel’s apology. USA Today. 21 March 2019.